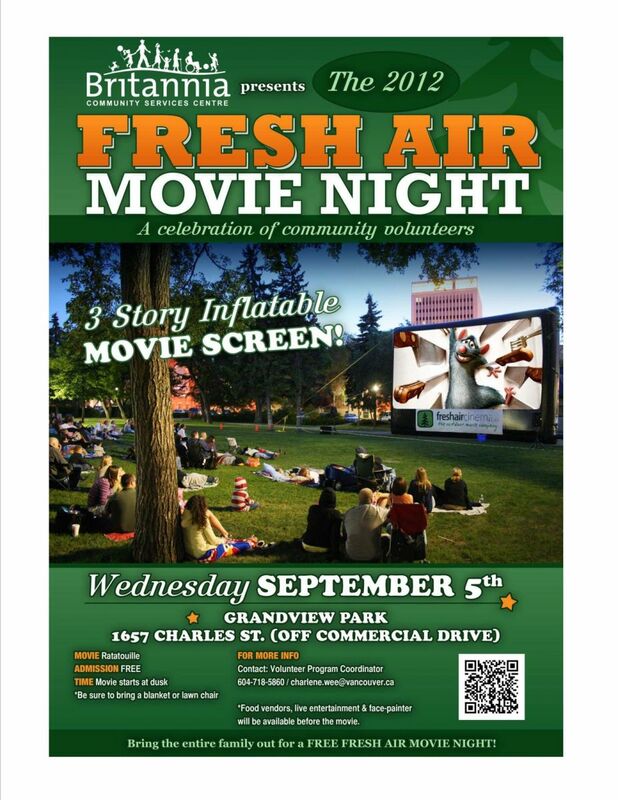 Britannia celebrates volunteerism with its first outdoor music and movie night on September 5, 2012 in Grandview Park. Due in large part to the work of the more than 300 volunteers who serve the Centre and the community, Grandview-Woodland is known to be one of the most dynamic, vibrant and engaged communities in the city. The volunteers keep that reputation alive, and “this event invites the rest of the Grandview-Woodland and Strathcona neighborhoods to recognize and celebrate the contributions and commitment that our volunteers at Britannia have made for the community, and do so in a fun-filled, safe and exciting environment,” says Li-Mei Yip, Britannia Volunteer and Volunteer Committee member. “The community has been involved in Britannia from the very beginning. We have many wonderful programs and ways to get involved. I am always welcomed as if I were family and I hope that others feel that way too,” says Allan Ross, local resident and long-time Britannia Volunteer. The services provided at Britannia not only bring respite, joy and pleasure to individuals and their families but they support people in gaining a foothold to make positive changes for themselves and the world around them. Event festivities begin at 6:30 p.m. with food vendors, face painting, music and live entertainment including Kutapira. Movie screening of the Pixar animated film “Ratatouille” begins at dusk. Time: Movie starts at dusk. Be sure to bring a blanket or lawn chair. In case of rain, film in Britannia Gym D.
Face-painter Lunar Marula will be present and you won’t want to miss some yummy food from the food vendors, The Chilli Truck and La Boheme Creperie!